In each guest’s honor, the bride’s family made a donation to Guiding Eyes for the Blind, a charitable organization that trains Labradors to be guide dogs. To give that an extra special impact, we created letterpress tags for each place setting with an illustration of their sweet lab Belle’s profile on them. The tags were tied to the menu card with a beautiful hand dyed silk ribbon. True story: after learning that 600 stems of hydrangea were held up in shipping delays, we quickly sourced 600 additional stems from a different source. Unfortunately the second shipment was sent to our studio in North Carolina by mistake! Putting our knack for resourcefulness to the test, we hired a courier to drive the product to our team in Virginia and received it in just five hours. Shortly thereafter, the original 600 stems arrived. So Lauren and Emanuel had over 1200 stems of beautiful hydrangea an we used every single stem! What a wonderful gift of memories you gave to us! You didn't miss an exquisite detail at all. Your organizational skills combined with your creative skills and hard work are beyond words. 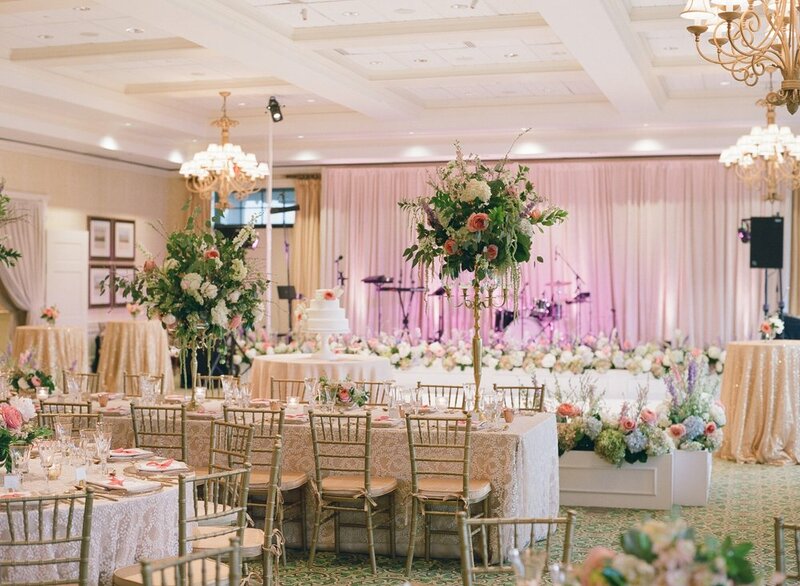 The Princess Anne was transformed into a beautiful and elegant venue! The flowers at all of our weekend events were over the top beautiful. You guys are the best of the best, and the talk of Virginia Beach! What a team!